Hello, my name is Ruth and I’m an in threes addict. I really love this pattern. I can’t help it – the cardigan’s so great for layering and adding a pop of colour to a baby’s outfit. I never fail to get a comment when Elena wears her lady bug in threes out and about. I was itching to do some knitting after my Kid’s Clothes Week sewing, so I cast on a little baby cardigan with some of my soft and squishy, hand painted 100% Australian wool yarn. I wanted something therapeutic, and I wanted to test out how this colourway knitted up. It’s an explosion of colour, and I like it. 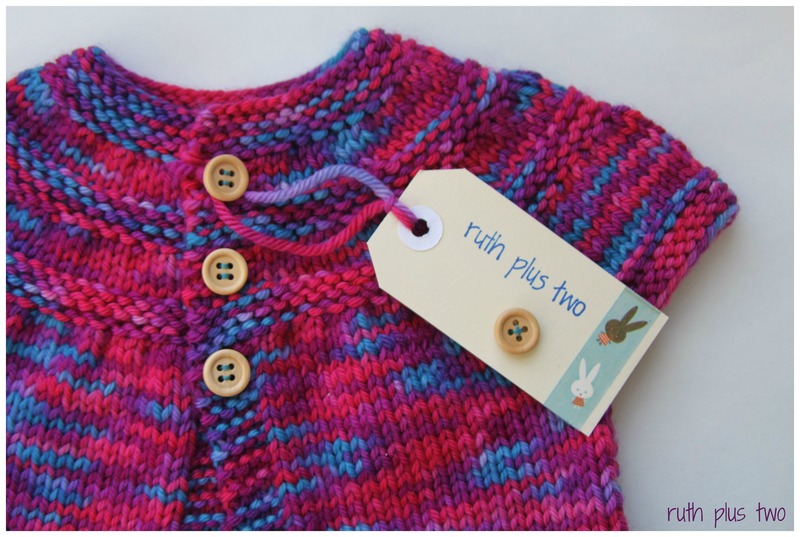 This cardi is a size 0-6 month size (to suit chest size 14-17″) with sweet little wooden buttons. 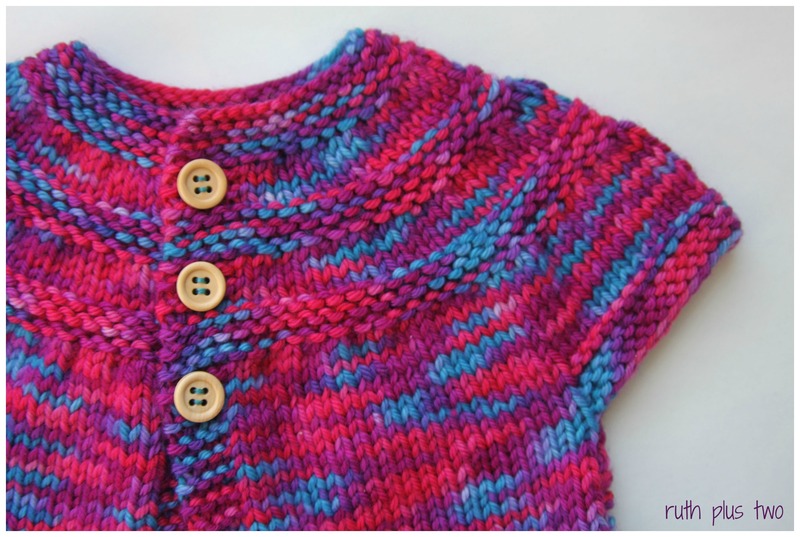 I don’t have any baby girls to knit for at the moment, so I’ve listed the cardigan for sale on my Etsy store. I hope it finds a loving owner soon! This entry was posted in baby, Etsy, gifts for babies, hand dyeing, in threes, knitting, yarn. Bookmark the permalink. This is just so cute! I really need to get on the knitting band wagon.,.. (I mostly sew). You should – it’s very addictive. It is gorgeous but I am equally excited by your beautiful branded tag! Thank you – I am rather pleased with how they’re turning out! There is an adult version of the pattern if you knit…! 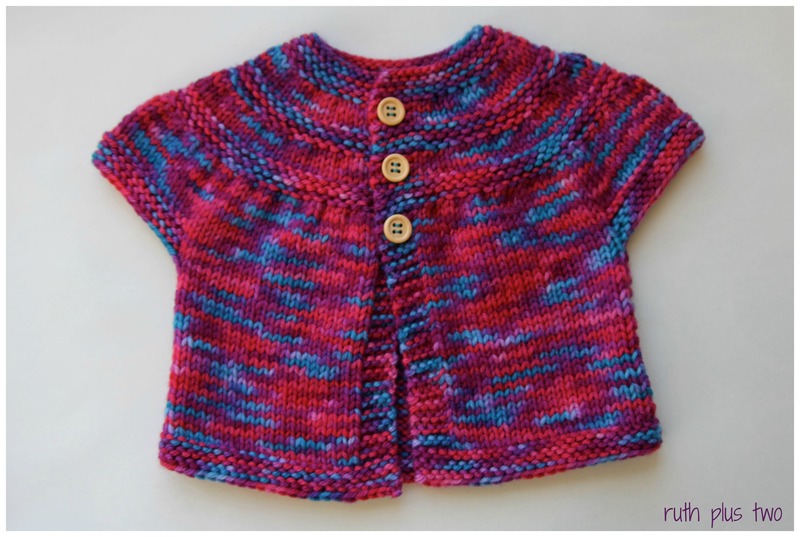 I love this cardi and the colours – you are amazing. But like Sutika I am very much in love with your tag!!! Top work Super Ruth. You are too sweet, as usual!